The bank had hoped that above-trend economic growth would drive up wages and eventually force companies to put up their consumer prices. Indeed, economic growth was robust in 2017 and early 2018; annual wage growth had risen to 2.5% by the third quarter of 2018, a percentage point higher than rates in 2016. But price inflation has not yet followed—it is subdued even in labour-intensive service sectors such as recreation or restaurants. Perhaps, ECB officials might have thought, this was just a matter of time. Slowing growth, though, has dealt their hopes a blow. Italy fell into recession in the second half of 2018; Germany narrowly avoided that fate. Production disruptions in 2018 explain some of the downturn, but the moderation has continued into 2019. Further deterioration could slow price rises. Peter Vanden Houte of ING, a bank, points to research by ECB staff suggesting that companies are most emboldened to pass wage costs through to prices when demand is healthy and inflation high. Neither condition is now in place. Investors are also pessimistic about inflation. Market expectations of inflation in the medium term have fallen since late 2018. 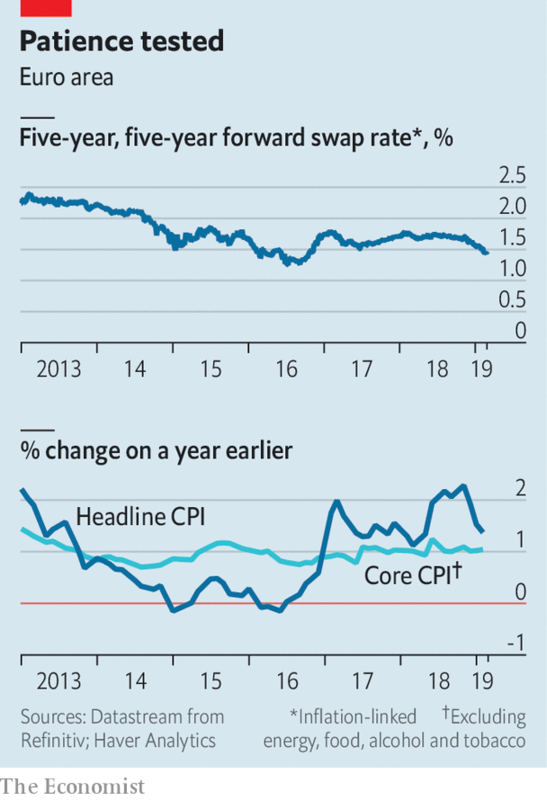 One measure favoured by central banks is the medium-term inflation-linked swap rate (see chart). That has fallen to 1.4%, well below levels reached in mid-2014, points out Andrew Benito of Goldman Sachs, a bank. 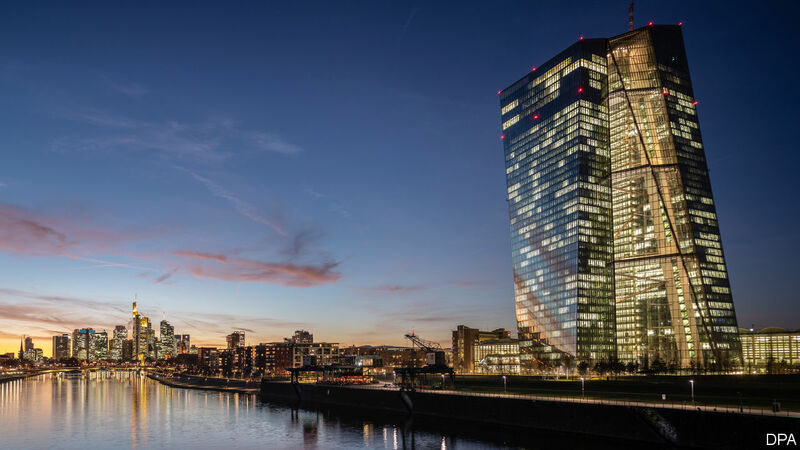 Back then Mario Draghi, the head of the ECB, pointed to falls in the measure as a threat to price stability; a programme of asset purchases soon followed. The bank’s most likely tool this time would be a change to its forward guidance on interest-rate rises. It has committed to keeping interest rates unchanged at least through the summer of this year; it could push that date out further. Some economists think it might extend its targeted longer-term refinancing operations, which offer cheap loans to banks. Depending on its design, that would at least avert tighter funding conditions. Though the scheme is due to expire next year, its loans will stop counting towards regulatory liquidity measures this summer, forcing banks to refinance early. Action next week is not guaranteed. Some ECB officials have indicated that they want proof that the slowdown is persistent. The head of the Dutch central bank, Klaas Knot, for instance, has said that he wants to wait and see. But the cost of delaying easing rises as the outlook for inflation worsens, and inflation expectations threaten to linger below the target. Excessive patience might be harmful.